In this July 7, 2018, file photo, Turkey's President Recep Tayyip Erdogan speaks in Ankara, Turkey. Turkey ordered authorities to "freeze the assets of America's justice and interior ministers in Turkey, if there are any"
Turkey will freeze the assets of two U.S. officials in retaliation for U.S. sanctions against Turkey's justice and interior ministers over the detention of an American pastor, Turkey's president said Saturday in a move that appeared more symbolic than practical. Speaking in Ankara, President Recep Tayyip Erdogan said Turkey had been "patient" since the U.S. Treasury sanctions were imposed Wednesday, but ordered authorities to "freeze the assets of America's justice and interior ministers in Turkey, if there are any." It is unclear who that would affect, due to differing Cabinet roles in the United States than in Turkey, or if the U.S. officials even have any holdings in Turkey. Turkey's Interior Minister Suleyman Soylu and Justice Minister Abdulhamit Gul mocked the sanctions against them this week, saying they have no assets in the U.S, but the deteriorating Turkish-American relations sent the value of Turkey's national currency — the lira— tumbling. Erdogan called the sanctions "serious disrespect toward Turkey" and accused the U.S. of hypocrisy for demanding the release of evangelical pastor Andrew Craig Brunson while its ally Turkey tries him over alleged links to terror groups. Brunson, who has lived in Turkey for decades, was jailed in December 2016 and is now under home detention. He is facing a 35-year sentence if convicted of the charges of "committing crimes on behalf of terror groups without being a member" and espionage. Top U.S. officials, including President Donald Trump and Vice President Mike Pence, have said there's no evidence against Brunson and demanded his release. Despite the announcement of sanctions, Erdogan called for a return to the two country's partnership. "We think there is no problem we cannot solve with the American administration," he said, urging Trump's government to drop its "hot-tempered attitude and return to its good senses." Bilateral conflicts include the arrests of U.S. citizens as well as local consular staff, U.S. senators who are pushing to block the delivery of American F-35 jets following Turkey's pledge to buy the Russian S-400 missile system, and Turkey's demand that Fethullah Gulen, a U.S.-based cleric, be extradited to stand trial for his alleged ties to a failed 2016 coup attempt in Turkey. Gulen denies the accusations. Yet another looming issue is whether the U.S. will impose a hefty fine on Turkey's state-run Halkbank after a New York court sentenced its deputy general manager for his role in helping Iran evade U.S. sanctions. Mehmet Hakan Atilla has about 15 months remaining in prison and media reports this week claimed Atilla and Halkbank may have been part of a deal for Brunson. 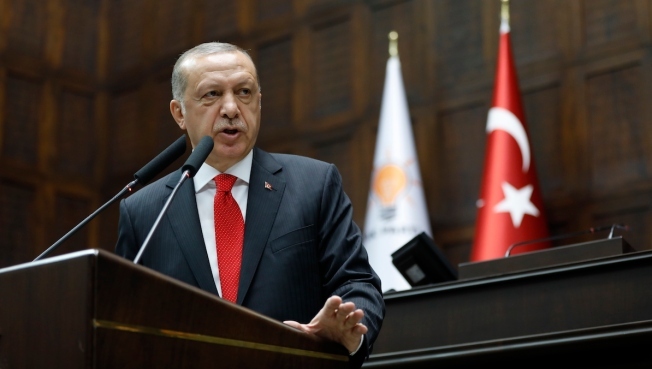 Erdogan accused the U.S. of attempting a swap and said the "mentality of swapping" did not fit his country, arguing that Halkbank had no link to the evasion scheme and should not be made to pay. Erdogan, however, had once suggested a trade between pastor Brunson and cleric Gulen. "We do not want to be part of a lose-lose game. To move political and judicial disputes to the economic dimension hurts both sides," Erdogan said as Turkey's economy shows serious signs of instability.